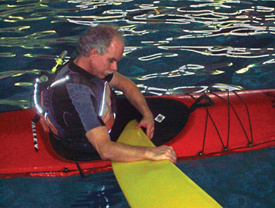 The Bow Roll Rescue is an easy way to right an inverted kayak and kayaker. Recently I’ve been developing and teaching a rescue technique for righting a capsized kayaker who hasn’t been able to perform a wet exit and needs help getting upright for air. Dubbed the “Bow Roll Rescue,” it addresses many of the shortcomings of other common rescue methods. The technique was discovered during a pool practice session and has been refined over more than a year of application and introduction to others in the incident management and rescue courses I teach. Hand-of-god : This rescue method assumes an inverted and unconscious or panicked paddler. You place your boat parallel and adjacent to the rescuee’s inverted boat, then by reaching over the inverted hull, in stages, roll the rescuee’s boat upright. In cases where you’re smaller than the rescuee and have shorter arms or lack sufficient strength, righting a beamy boat or a heavy paddler can be almost impossible. The struggling may lead to partial success followed by the re-immersion of the rescuee. That could be fatal if the rescuee is gasping for breath at the instant of re-immersion and aspirates water. The hand-of-god rescue also places you immediately next to a panicked rescuee who may be thrashing wildly. Again, in the case of a larger, stronger rescuee, this may not bode well for you. Spraydeck Release, Float and Scoop : This rescue method also assumes an inverted and unconscious or panicked paddler. It may be utilized when you know that you likely won’t be able to perform a hand-of-god rescue. You reach down to release the spraydeck of the inverted paddler, then grab the paddler to float him out of the cockpit and to the surface. After ensuring that the rescuee is breathing and relaxed, a scoop rescue slides the rescuee back into his kayak. This rescue can be challenging in rough water. Its several stages are labor intensive for you and expose the rescuee to full immersion, which, in cold water, can take its toll. This method also places you immediately adjacent to a panicked and potentially dangerous rescuee. Bow Presentation : The inverted paddler signals that he needs help, usually by slapping the hull and/or waving his hands. You place the bow of your boat near the hands of the inverted paddler, and he uses your bow to right himself. 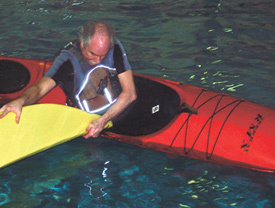 This rescue only works for conscious paddlers who are familiar with the technique. In rough water, your bow may run into and cross over the hull of the rescuee’s boat, or the rescuee may have difficulty locating and getting a hold on the bow in heaving seas. 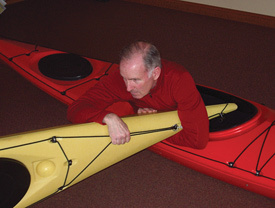 Paddle-Across : This variation on the bow presentation rescue places your boat parallel and almost adjacent to the inverted paddler’s boat. You place a paddle across the deck of your boat and the hull of the inverted boat, then grasp the inverted paddler’s wrist and guide his hand to the paddle shaft. The inverted paddler can then right himself. 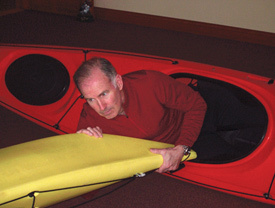 This rescue method works fairly well for conscious paddlers who are familiar with the technique. It can put some stress on paddle shafts and blades, so care must be used to place the paddle safely and keep the boats properly spaced during the rescue. There is some risk, especially in rough water, of the rescuee hitting his head on your boat. Here, too, the close proximity to the rescuee leads to risk if he is panicked. You also have lost some control of your own paddle as it has been placed directly in the hand or hands of the rescuee. For the past few years, I’ve been looking for an easy rescue technique that any paddler can perform on any other paddler regardless of size, strength or experience. The method had to work whether the rescuee was conscious or not, and it needed to work as well in rough water as it did in calm. It also had to maintain a margin of safety for the rescuer in case of an uncooperative or panicked rescuee. Fellow paddlers Paul Redzimsky, Mike Agostinelli and I were playing in a pool session one day. Paul and Mike were trying to capsize each other by grasping and rotating the bow of the other’s boat. After some time, they decided to see if the reverse would work—if a capsized paddler could be rolled up via rotation of the bow. They had some success, and I was instantly intrigued. I had no trouble doing the Bow Roll Rescue, as I called it (the “Redzimsky-Agostinelli Maneuver” had a nice ring to it but wasn’t very descriptive), but few of the people I showed the technique to could do it well or consistently. Over time, I realized that my 30 years of practicing ju-jutsu played a significant role in my understanding of how the technique needed to be applied for reliable execution. I’ve begun to use the Bow Roll Rescue almost exclusively in real situations and simulations (drills) when time is of the essence. At the kayak center where I teach, all of the kayak staff are required to know the Bow Roll Rescue. I have yet to find someone too big to rescue or too small to perform it. I now teach the technique first in a land session where the principles and mechanics of the technique can be explained and practiced without subjecting some poor “victim” to extended immersions. 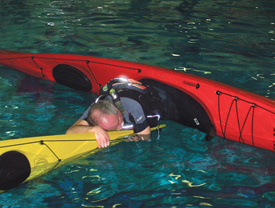 For dry land training, there is no paddler in the capsized boat. After the method is working on land, we then move to water where success quickly follows. 1a. Practicing the Bow and Keel Grasp on land. 1b. 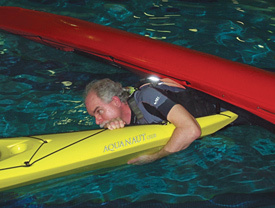 The capsized kayak offers good support to the rescuer beginning a Bow and Keel Grasp. 2a. Practicing the Bow Slide on land. 2b. Keep elbows down during the Bow Slide for safety. Let the inverted boat begin to roll, deck facing away from rescuer. When the bow of the inverted kayak has moved over your spraydeck, put your kayak back on an even keel. As your coaming rises, it will lift the bow of the inverted boat. As the bow rises, pull the keel toward you to get the bow to rotate in the proper direction. It’s essential that the inverted boat be rotated to bring the keel toward you so that the capsized paddler will rise on the side opposite you. 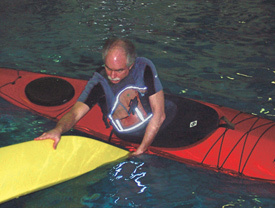 As the bow rotates, the flotation of the capsized paddler’s PFD will easily float him to the surface. 3a. Practicing the Bow Quarter-Roll Float on land. Note the stable position of the rescuee’s boat. 3b. The flat side of the rescuee’s bow will rest easily on the rescuer’s spraydeck. At this point, a conscious paddler may surface enough to get a breath of air. He may also be able to hear you, so you can encourage him to relax and reassure him that all is going well for the rescue. Since the kayak and paddler are in a stable position with the bow resting on your coaming, the rescuee is not likely to be resubmerged. That lessens the risk of water aspiration and/or panic. Proper technique, not strength, is what makes the next step, the Hull Hug, work well. If it’s done correctly, it’s very easy, requires almost no strength and presents almost no risk to you. If it’s done incorrectly, the Final Roll-Up (the following step) is awkward to perform, requires strength and poses some risk of injury to you. With the bow of the rescuee’s boat stabilized on its side on your spraydeck, lie across the kayak bow and encircle it with your arms. Your off-side armpit (that farthest from the capsized kayaker) should engage the upward-facing deck-to-hull edge of the rescuee’s boat. The crook of your elbow of that arm should angle around the downward-facing deck-hull edge of the rescuee’s boat. Your off-side wrist or fingers should be hooked around the keel of the rescuee’s boat. It’s very important that you adjust the angle of your arm and position of your body so that all joints mate with the inverted kayak’s edges and your body is completely in contact with its bow. This is essential to maximizing the grip necessary to rotate the capsized paddler’s kayak without excessive effort, strain or injury. Not all inverted kayaks will have full perimeter deck lines. Some may have perimeter deck bungees or something else that won’t provide a solid, stable connection to the boat. The Bow Roll Rescue is still possible with these kayaks, but it’s harder to do when you can’t get a solid, stable connection. If you’re trying to right a kayak that doesn’t have perimeter deck lines to grab, the upper-facing deck-to-hull edge of the rescuee’s kayak must be mated to the crook of your wrist. This makes the rescue a bit harder on slippery rounded hulls and requires a bit more hand strength or grip. Full perimeter deck lines not only make this rescue easier, they help make many rescue techniques easier. They should be a standard feature on any sea kayak. 5a. Final Roll-Up practice on land. In calm conditions, head may be kept up to watch rescuee. 5b. Retaining tight Hull Hug during Final Roll-Up is key to ease, safety and success of technique. The torque needs to be sufficient to roll the rescuee to an upright position regardless of his weight and height. To get this torque, attempt to raise your boat into the air by lifting your hips. Of course you won’t actually be able to lift your boat into the air, but this is the best way to focus your efforts. By “lifting” your kayak, you’ll generate a downward force on the side of the rescuee’s bow. The resulting torque will easily roll the rescuee’s boat to an upright position. If you are small and are trying to assist a much larger rescuee, it may be necessary for you to focus more intently on trying to raise your hips and kayak out of the water. This will provide a greater torque to roll the inverted boat. If the roll-up is progressing easily, you should keep your eyes up and focused on the rescuee to aid in assessing his condition. If the roll-up is demanding your full concentration to maintain the Hull Hug—as is often the case in rough water—keep your head pressed to the side of the inverted boat’s hull. This will maximize grip as well as minimize the risk of impact to your head by the inverted boat’s hull in rough water. It’s relatively easy to give the Final Roll-Up too much momentum and have the rescuee recapsize on the side closest to you. The force required to perform the Final Roll-Up is greatest at its beginning and reduces quickly as the inverted paddler progresses to an upright position. Very little force is required at the end of the Final Roll-Up. 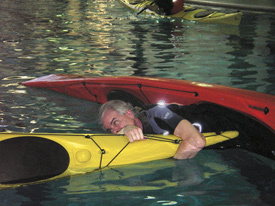 An unconscious or panicked paddler may in fact continue moving to the other side of his kayak as the Final Roll-Up is completed, thus encouraging another capsize. You should reduce the force applied as the Final Roll-Up completes, maintain a full Hull Hug, and be ready to reverse direction if the rescuee flops across the deck to the other side. It’s not hard to end smoothly if these possibilities are recognized and anticipated. In other words, don’t quit the rescue to celebrate early. Proceed to the next step (finish position) and hang out there for a moment to be sure you are done. 6a. Finish Position practice on land. Rescuer is looking at rescuee to assess condition. 6b. Relax in water while retaining Hull Hug for a moment to check rescuee’s condition. If the rescuee is conscious and composed, the rescue may be nearly over at this point; you can gently release the Hull Hug and bring yourself back to an upright paddling position using the bow you’re holding. 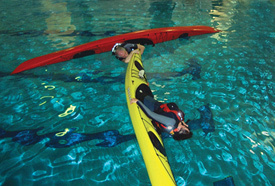 If the rescuee is unconscious or uncooperative, then additional steps will need to be taken to complete the rescue and prevent a second capsize. At least one more willing and able paddler trained in wilderness first aid and towing will be helpful. After you’ve finished your land practice, go to the water and practice the technique starting with smaller rescuees and gradually working toward the largest. Rescuees should vary their reactions from simulating unconsciousness to being rigid and erect to flailing so rescuers can become familiar with the feel of all variations. Practice the Bow Roll Rescue until your form is correct on both sides. As is often the case with most physical actions, you will probably find one side tougher to do correctly. 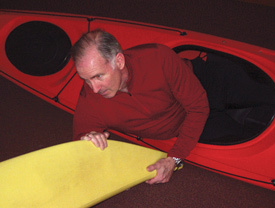 In an actual rescue, you’ll need to approach the capsized kayak as quickly as you can. Don’t waste time maneuvering to bring a favored side to the capsized kayaker’s bow. Focusing your efforts at trying to lift your boat out of the water will produce the results you want, but neither you nor anyone watching you perform the rescue will see much vertical movement in your boat. If you’re familiar with the kayak review hydrostatics listed on Sea Kayaker’s website, you know that it takes nearly 100 pounds of force to effect a one-inch change in the waterline of most kayaks. 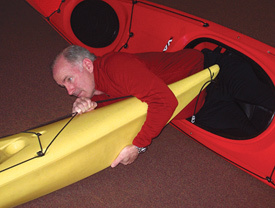 Because this key element of the rescuer “lifting” his kayak is largely invisible, knowing the correct technique is essential. When I’ve demonstrated this technique on the water to those who have never seen it before, few have been able to perform it based on their observation of it. Even if you have mastered numerous rescue techniques, don’t discount practicing on land. Of those students I’ve taught the technique to, those who have mastered the technique on land have 100 percent success rate in water. Most succeed on the first attempt; the rest need only a reminder of a key point or two to succeed within a few more attempts. Paddlers who have become proficient with the Bow Roll Rescue have commented to me how easy it is to perform in various conditions. The Bow Roll Rescue is safe: it poses little risk of injury to rescuer or rescuee; effective: it works in calm and rough water; and efficient: little effort or time is required to execute it. 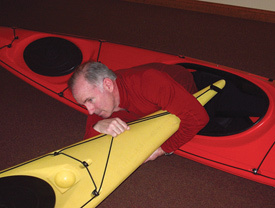 With practice, you can expect to have the capsized kayak fully righted five seconds after making contact with its bow. The Bow Roll Rescue offers some great advantages over other common rescue techniques. It works well in calm and rough water, with panicked or unconscious paddlers, and in spite of significant size and strength differences between rescuer and rescuee. I believe it’s a method that should be in every paddler’s repertoire. As you practice with the Bow Roll Rescue, you may discover modifications that may improve the technique. I welcome your feedback. I’d like to make sure any useful modifications are shared with everyone. John Martin is an ACA instructor and BCU coach who loves experimenting and playing on the water. 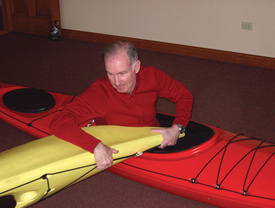 He instructs for Geneva Kayak Center in Geneva, Illinois, and especially enjoys teaching incident management and rescue courses. John has created a website for the Bow Roll Rescue, which includes a video clip of the rescue (www.bowrollrescue.com ). The video can also be viewed on Sea Kayaker’s website (www.seakayakermag.com ) with the online supplements for the October 2007 issue. This entry was posted on 12 September 2008 at 2047, modified on 12 September 2008 at 2053 by John.